Autumn is one of the most fun times of the year, from the colourful, falling leaves and conkers to bonfires and trick-or-treating so what better way to while away the days as they draw in than to snuggle up with a seasonal book. Here are a few picks for you to enjoy with your children whether they are toddlers who are exploring board books or school age kids who are reading by themselves. This classic bedtime story has a lovely autumn twist as the Nutbrown Hares chase leaves and having fun outside. This and the other three books in the series explore the changing seasons and are great all year round. 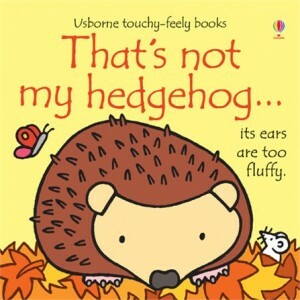 Perfect for toddlers, the ‘That’s not my’ books help younger children to explore textures and introduce a sensory angle to reading. What could be more in keeping with the season than prickly hedgehhogs in piles of red, orange and brown leaves? You could also try ‘That’s Not my Squirrel’ and ‘That’s Not my Owl’. This is part of a series about Penguin and in this seasonal tale he goes to ‘find’ autumn, his baby brother Pumpkin wants to join in too but is too small. It’s a cute story with bright, clear illustrations and is perfect for children with baby brothers and sisters. A must-have for all young Peppa Pig fans. Peppa and her friends celebrate Halloween by going trick or treating, have a Pumpkin Party and having pumpkin pie. For slightly older children, this is a special story from the Rainbow Fairies collection by Scholastic. Autumn the Falling Leaves Fairy needs help from two girls to restore her autumn magic before Jack Frost ruins everything. This rhyming tale follows three friends searching for autumn leaves. Rhyming books are great for learning simple sight words and this jolly book also has lively illustrations that will encourage children to go play outside with the piles of fallen leaves when they’ve finished reading. Autumn-themed books are a great way of exploring all the changes that come with autumn and learning some positive messages and new words at the same time.